Packing 7 functions and measuring just 2 ¼ in length, the Victorinox Swiss Army Jetsetter is the perfect addition to any keychain. This model is unique from most in that it does not feature a blade, allowing it to be flight friendly. Keep all the essential Swiss Army Knife functions at hand without the worry of airport regulations. Durable enough to last a lifetime, and guaranteed for it, you can rely on this knife for years to come. With elements such as a magnetic Phillips screwdriver, scissors, and bottle opener you'll always have the right tool for the right situation. 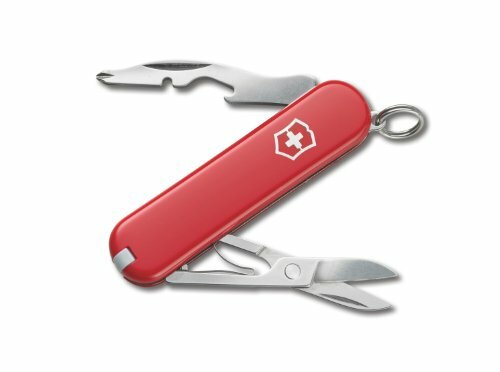 Like all Swiss Army Knives, the Manager has a lifetime warranty, stainless steel implements and Swiss-made quality and durability. In 1884, Master Cutler Karl Elsener opened a cutlery shop in Ibach, Switzerland. There, he and the cutlers’ union he formed produced the finest steel cutlery, finished with the now-famous proprietary edge preferred globally by professional and home cooks. In 1891, Karl supplied the Swiss Army with its standard issue Soldier’s Knife and in 1897 with the Officer’s Knife. In 1921, after the death of his mother, Victoria, and with the advent of stainless steel, then known as “inoxydable"" and used in the production of his cutlery, Karl changed the name of the company to Victorinox. It is from those humble beginnings that a worldwide icon was born.